You don’t find many townhouses in Soho, a neighborhood better known for its massive warehouses converted to lofty apartments. The next best thing? 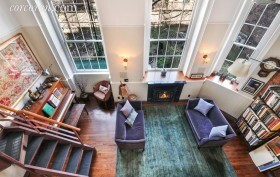 This triplex condo at 29 King Street that feels a whole lot like a townhouse. Each of the three floors is accessed by a private elevator, with a double-height living room that looks out onto the unit’s 900-square-foot garden. The townhouse layout then comes with condo perks like a full-time super, laundry room and storage.